I think most people would agree with this decision - there's not much interesting about this album. I actually really liked this album when it came out, and (being the eternal presentist) would have put it above The Bends back then. While this album probably contains about as many quality songs as some others on this list, nine years have made me realize that there are simply too many songs on this album, and a lot of them are pretty so-so. Again, being the presentist that I am, I put this album at #3 of my list of top albums of 2011. I don't necessarily think that this ranking was too high, so it must say something about my affinity for the band if this album only comes in at #6 when compared to their others. The toughest decision for me when putting this list together is probably deciding between this album and TKOL for #5. I find Amnesiac to be pretty inconsistent, and there are definitely a couple of tracks that I skip over when I'm listening to it. But the highs of "Pyramid Song" and "I Might Be Wrong" are above those of pretty much any song (save perhaps "Little By Little") on the other album, so this one barely squeezes ahead. For a while there I didn't give this album enough credit because I got caught up in all the experimental goodness that the band was trying out in the 2000s. However, I have to admit that there are just too many really good songs on this album, even if they aren't breaking any barriers. Some may question whether this album can go punch-for-punch with The Bends, but I think that it does much more artistically, so it gets the nod. It's also probably the best mix of the many sounds of Radiohead in one single album. Bonus points for the pay-what-you-want pricing scheme they used to sell the album upon release. This is the album that got me into the band, and what an introduction it was. There are loads of classic songs on this album, so it's no wonder that it routinely tops critics' lists of the best albums in recent memory. So I don't get any heartburn when some people say that this is RH's best album. It's just not my favorite. There was a time when people lined up at record stores on Monday night so that they could get a highly anticipated new release at midnight. 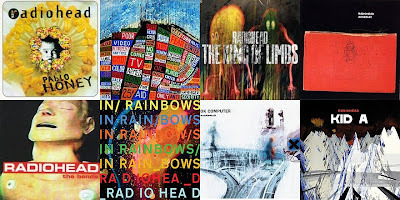 That is what I did for this album (well, maybe not lined up, but at least showed up at midnight) because I had fallen in love with OK Computer and then, to a lesser extent, The Bends. And when I first listened to the album I thought..."W...T...F?! Is this music?!" The only song that I could say that I liked the first time around was "Optimistic", so I clung to that on subsequent listens. But the more I listened to the album, the more I grew to love it...even more than the others. There's much more that I could bore you with regarding this album, but suffice it to say that it is my favorite album *ever*.